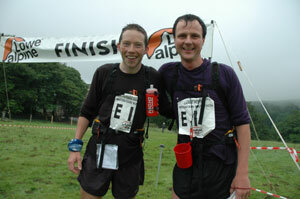 Morgan Donnelly and Steve Birkinshaw win the Elite Course. Competitors at the LAMM were woken this morning at 5 a.m. in the traditional way – with the sound of bagpipes, played by Niall Watson, one of the regular marshals. For details of the tunes, click here. (Niall promises some more tunes for tomorrow, just for variety). 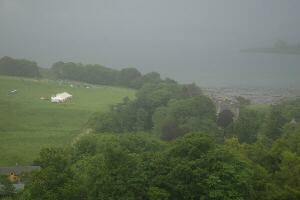 Like Brigadoon emerging out of the mists, the LAMM 2005 tented village is appearing on a large field, slightly to the north of the fabulous Torosay Castle and gardens on the Isle of Mull. As always the exact location of the event has been a closely guarded secret right until the last minute, with the 1,200+ competitors only finding out today just where they were headed. The 2005 LAMM is based on the Isle of Mull with parking on the mainland in Oban. From Argyll Square in the centre of the town, take the A816 Lochgilphead road for 400 metres and pass a Shell garage on the left hand side. For your information, the petrol prices are quite good here. After another 200 metres, pass Oban High School on the left hand side. Immediately before the Gleaner Shell Petrol Station turn left and follow LAMM signs. If you are driving via Glasgow you should allow extra time for roadworks on the Erskine Bridge. The LAMM car parking and access to the Event Centre will close at 10pm on the Friday evening. 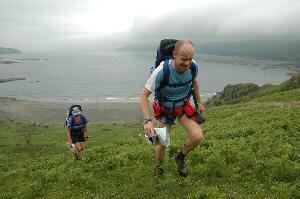 We have arranged the option for you to camp at an excellent campsite 3 miles south of Oban. From Argyll Square in the centre of the town follow the brown tourist road signs south along a narrow coast road to Gallanach Campsite (also signed sometimes as Oban Caravan & Camping Park, NOT Glenshallach Campsite). Please visit the white house on the centre of the campsite and pay for your camping on Friday night even if it is late. The managers, Judy and Howard Jones, would prefer this to being woken early on Saturday morning. A nice spot to camp is in a small enclosure opposite the campsite and overlooking the Sound of Kerrera. If you expect to arrive at Oban by train from Glasgow at 15:39 or 21:18, please telephone 07836 384853 and we will arrange for you to be met. ARRIVING BY HELICOPTER OR AEROPLANE? If you expect to arrive at Oban by helicopter or light aircraft, please telephone 07836 384853 from your final refuelling location and we will guide you to a suitable field.